Thanks for stopping by this week! I hope you had a good week and got a lot of reading done! I didn't finish any new books this week, unfortunately. I have been reading Rebecca by Daphne du Maurier, but haven't spent a lot of time reading this week, so I haven't made it very far. I'm about a quarter of the way through, and I can't decide if I like it yet. I guess we'll all know what I think by next week ~ at least we better!! I did publish a review of The Power of Your Child's Imagination by Charlotte Reznick. And I wrote a review for a great children's book called Dirt: Jump into Science by Steve Tomacek. And finally, I published my weekly What My Children Are Reading recap, which was focused on a couple early reader series my kindergartner has been enjoying. I'm hoping to put in a lot of reading time this week and finish Rebecca soon. That is my goal. Then I'll be starting on a book on my Spring Reading Thing Challenge list. I'm not sure which one yet, though. So, what are you reading this week? 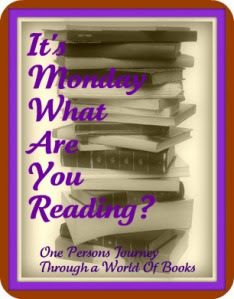 This meme is being hosted by Sheila at Book Journey, so hop over there if you'd like to see what others are reading too. I want to read Rebecca, but it's one of those books that I'm going to have to set my mind to first! Rebecca was a book I wanted to read last summer (yes, last summer) it was on my to do list and it never made it off the shelf. Cant even remember why I wanted to read it so bad. Still should try it though. My vote is for Jonathan Livingston Seagull, but that's just because I like the name. Have a great week! Hope you're enjoying Rebecca - such a great book! You may not have finished your book, but it sounds like you've been busy blogging and writing reviews! You asked me about Shutter Island. I think Shutter Island is more suspenseful than scary. There's lots of action, plus a strong psychological element. There are some gruesome crimes mentioned, but I didn't think it was all that scary. Hope you enoy the rest of Rebecca! You will love Rebecca! I hope you get some time to get to it! Hope you have fabulous reading week!